CCM blog is changing things up. If you have noticed, there is now a "Guest Authors" page on the site. For you today, I am proud to present a guest post from Philip Fanara. Please see Philip's credits at the Guest Authors page. Enjoy! The stock market is not fair. It does not care about your mortgage, your children’s education, or your well-being. Simply put, the stock market is the last resemblance of a capitalistic society. In a world of big brother government regulations saving people from themselves, the stock market still holds its own – bankrupting the ignorant and making millionaires of the wise. Hundreds of billions of dollars change hands in the stock market on a daily basis. In the short-term, profits randomly flow to all participants; some ignorant investors may catch a break and some wise investors may pull the short straw. However in the long-term the market acts as Lady Scales; the wise investors eagerly gobble-up the life savings of the ignorant gamblers. Hence, the rich become richer and the poor find a second job to help support the rich. If you have not yet been successful in the market, do not fret. The average investor is not successful; only a minority of investors ever become rich trading stocks. Does this mean it is impossible to become successful? Of course not. You just need to be smarter and more rational than the average trader, which in reality is not so difficult once you understand why traders act the way they do. Welcome to my world. My name is Philip Fanara, a.k.a. “The Stock Market Outsider,” and I profit from the rampant greed and fear that exists in the marketplace. How do I pull this off? First I only invest in fundamentally strong, undervalued companies. I never hold stocks for the long-term. My goal is to earn a small profit then get out. “Treat the stock market as a sea of fish. Sail out a moderate distance and cast your small net. Catch the majority of the fish in that area, sail back home, and sell the fish to buy a bigger net. 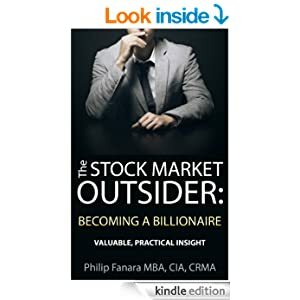 Author of "The Stock Market Outsider"